WAFFLES: Hey, Boss! 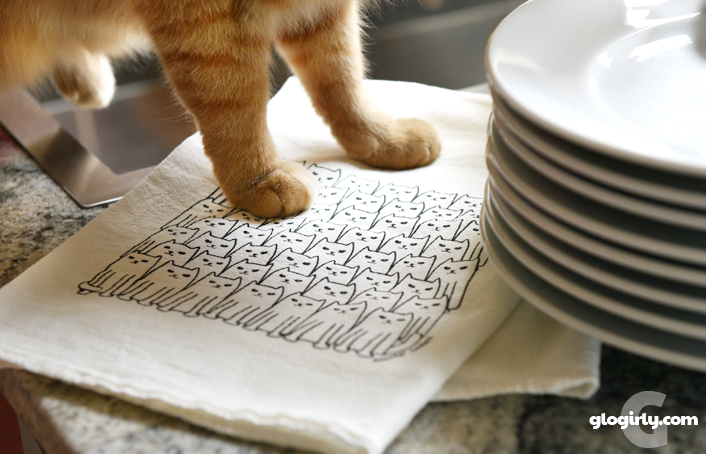 Glogirly's got a new kitchen towel. With CATS. Now I can help with the dishes. KATIE: You do know that means getting your paws wet, don't you Waffles? WAFFLES: I'm just going to dry. KATIE: Oh yeah? Well I suggest you get the hello-kitty out of that sink before it fills up with water. WAFFLES: That was a close one! This dish drying stuff is dangerous. 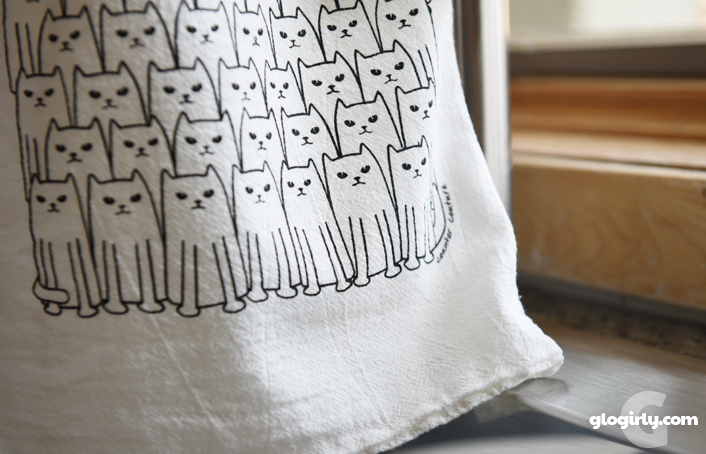 Isn't this kitty flour sack towel just the cutest??? What you can't see in this photo is that one of the 55 kitties on it is daydreaming with his eyes shut. Glogirly has been known to go through paper towels like they're jelly beans. So she's been trying to curtail her Bounty and Brawny obsession. And what better way to trim back on her paper towel hoarding than with beautifully designed flour sack towel?! She found it on the Counter Couture Etsy Shop and couldn't resist. Just before she was about to check out, another one caught her eye. 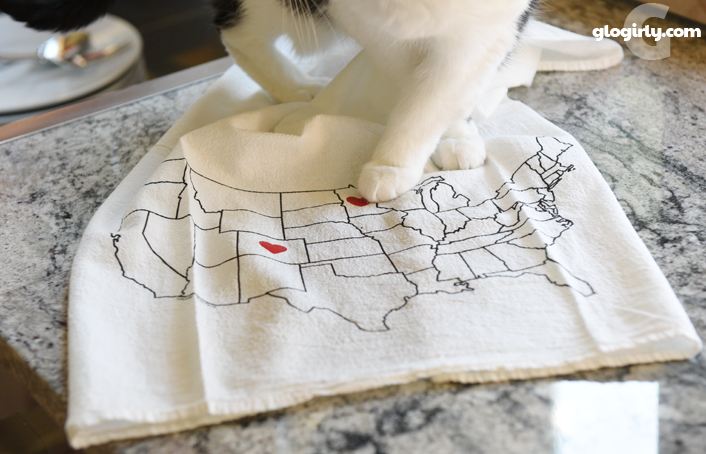 It has a simple line outline of the United States and you can choose which states your heart is in. 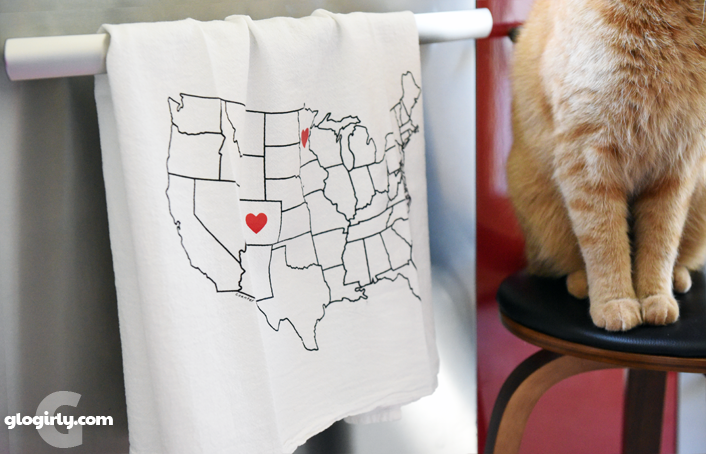 So of course, she chose Colorado and Minnesota. KATIE: Even when Gloman is apart from us, I have his heart right here. 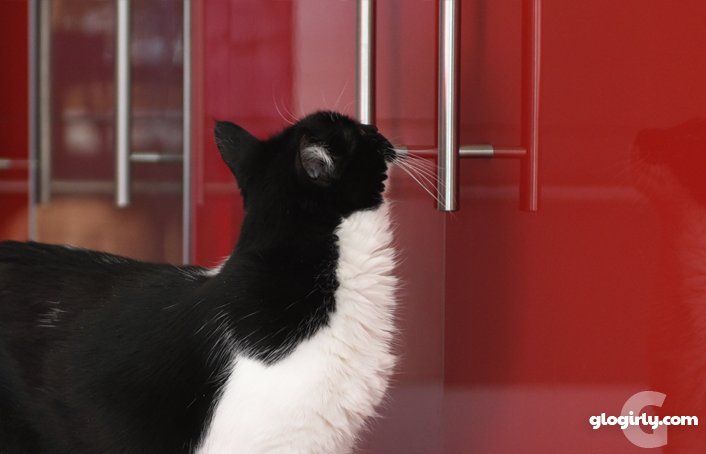 WAFFLES: Until he sees you're on the kitchen counter. 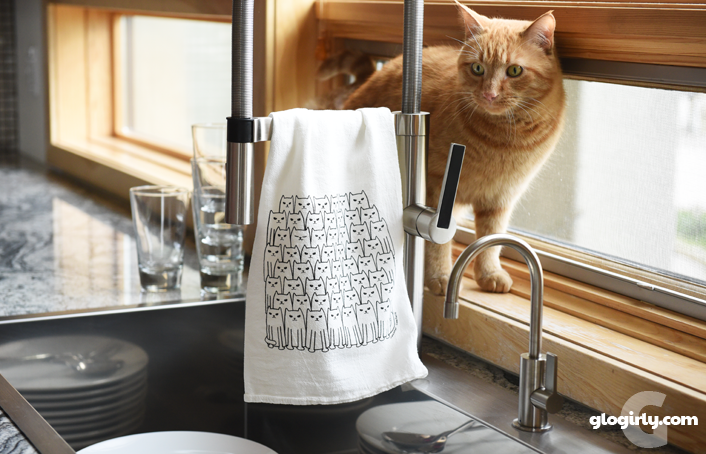 The flour sack towels are 100% cotton and hand screen printed. They're just the right weight for drying those pieces Glogirly doesn't put in the dishwasher. They're the best for cleaning eyeglasses too. It turns out that Counter Couture is right here in Colorado. We knew they were something special. *FTC Disclosure: GLOGIRLY is a participant in Etsy’s affiliate program. This means that if you decide to purchase through any of our links, we get a small commission. We only spread the word about products and services we’ve either used or think you'd like to use too. So cute! The towels too! Both these towels are adorable! 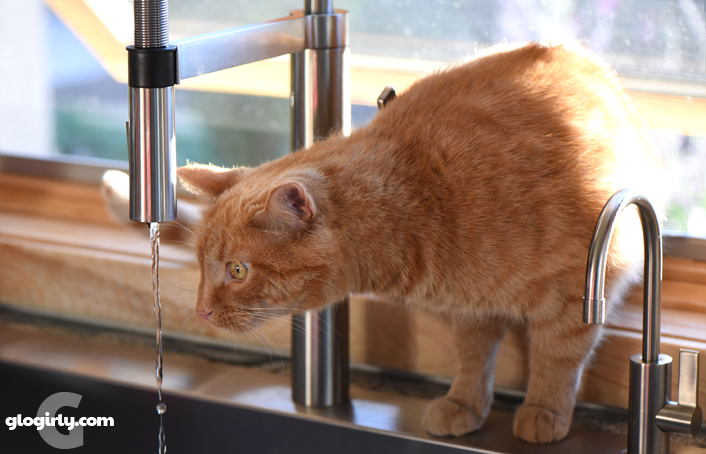 My human's favorite is the one with the cats, of course. What cute towels! They would make wonderful gifts. I love the towels - good tip. My cats never offer to do the dishes, what a gem Waffles is. Those towels are so cute! That was a close call, Waffles. Good job warning him, Katie! 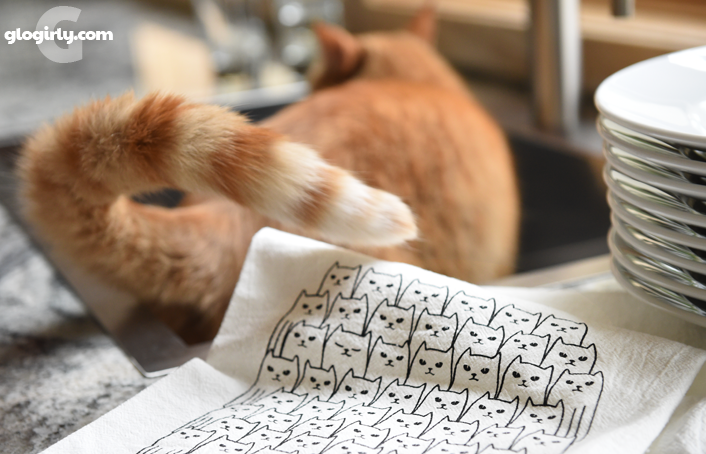 Adorable towels! Poor Waffles, he's always a day late and a dollar short, knowwhatImean?